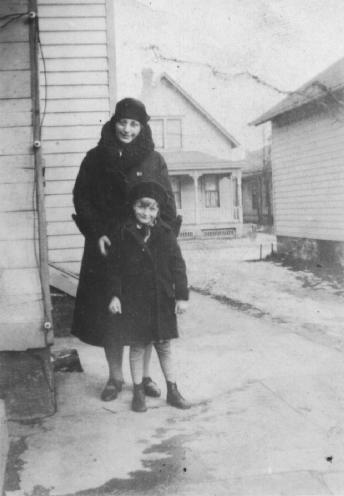 Elizabeth (née Schwert) Mayer, along with Grace Elizabeth Mary (no date). Elizabeth Schwert was the daughter of Franz Carl and Julia Anna (née Schlia/Schlee) Schwertfeger/Schwert. Elizabeth was born on November 18, 1886, in Buffalo, NY. 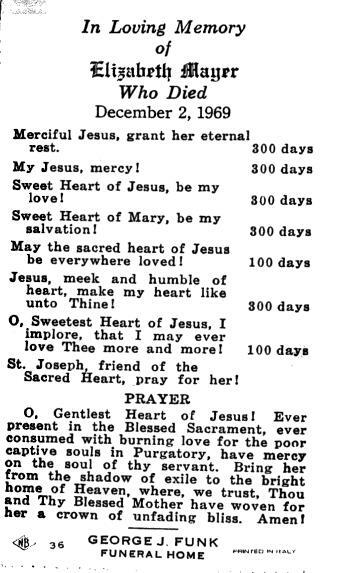 On November 21, 1886, she was baptized at Saint Boniface R.C. Church, 124 Locust Street, Buffalo. Elizabeth would visit her girlfriend who worked at "Sterr's Deli" on Genesee Street in Buffalo. There, she met Arthur Mayer, who was from Rochester, NY, and was related to the Sterrs. 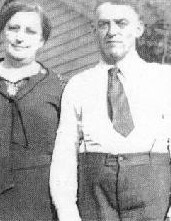 Elizabeth and Arthur were married on June 25, 1912, at Saint Boniface Church on Mulberry Street in Buffalo. They lived with Arthur's mother at 7 Reed Park in Rochester. Elizabeth and Arthur had three children: Mildred, Gerard, and Arthur, Jr. 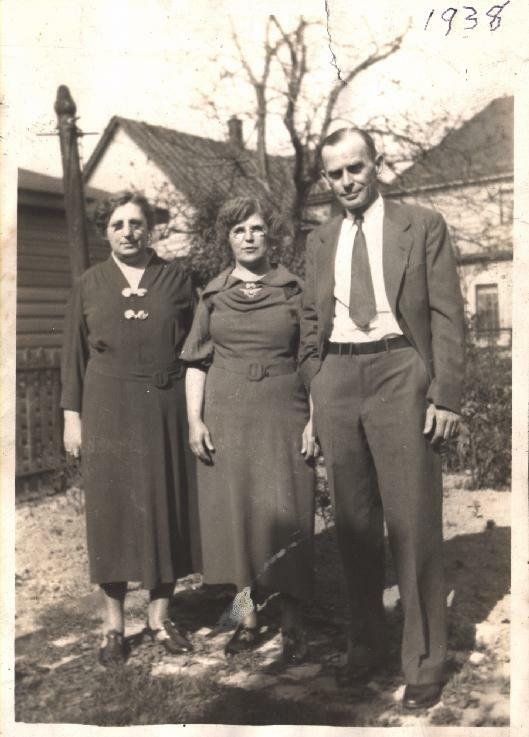 The family made many trips to Buffalo to visit her parents and Elizabeth's sister, Martha and family. They brought goodies for Martha's children. Art was a silver plater. As a result of inhaling fumes, Art developed lung disease and died in 1939. Elizabeth's brother, Joseph, tried to help her and the children out financially. But the home was sold, and Elizabeth moved from place to place. She first stayed with her friends, the Albright girls, then with her daughter Millie and her husband Charles H. Vitello in Rochester. 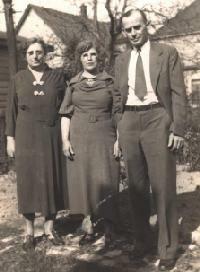 Elizabeth later moved to Highland Springs, VA, and lived with her son, Gerard, and his wife, Effie. Elizabeth's sister, Martha would sometimes visit and bring Elizabeth back to Buffalo for a month or two. Elizabeth was a tall, big-boned woman, very outspoken, and a no-nonsense kind of person. Life was a struggle for her, but she never complained. Elizabeth's spirit pulled her through many a hard time. She died of a heart condition on December 2, 1969, in Richmond, Virginia, and is interred in the Richmond region. 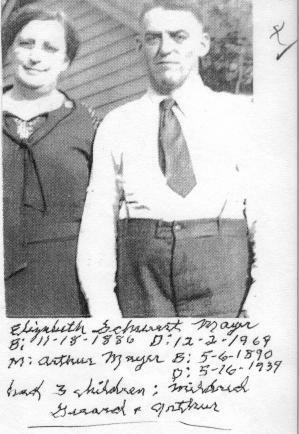 Elizabeth (née Schwert) Mayer and Arthur Mayer. (Undated photo). Mildred M. (née Mayer) Vitello: Born 1915; died 1998. Gerard Mayer: Born 1916; died 1985. Arthur Mayer, Jr.: Born 1918; died January 1969. Baptismal Record: Saint Boniface R.C. Church record of the baptism of Elizabeth Schwert on November 21, 1886. Marriage Record: Elizabeth A. Schwert and Arthur Mayer, June 25, 1912, Saint Boniface R.C. Church, Buffalo, NY. Mass Card: Funeral of Elizabeth (née Schwert) Mayer, who died December 2, 1969.